Reminder – The club is open over the first week of the Easter Holiday! Kingfisher operates in the site of Milton Park Primary school and offers before and after school care for children between the ages of 5 and 11. 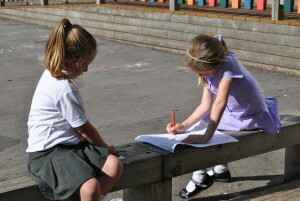 The club mainly caters for children who attend the school, however is open to other children from neighbouring schools. You can also download copy of the registration form by clicking the link below. Provide a happy, safe, warm and stimulating environment for all children to play, learn and develop freely. Encourage children to have a positive attitude and respect for both themselves and other people. Provide a positive relationship with parents/carers and work in partnership with them to provide high quality play and care for their children. Offer inclusive services that are accessible to all children. Undergo regular monitoring and evaluation of our services to ensure that the Club continues to meet the needs of children and parents/carers. Keeping them informed of our policies and procedures. Care and activities that put the needs and safety of the children first. Activities that are interesting, stimulating and fun. Activities that promote each child’s social, physical, moral and intellectual development. A staff team that is experienced, well-trained and properly supported. Services that meet the conditions of the Children’s Act 1989 and all other relevant childcare legislation, wherever they apply.